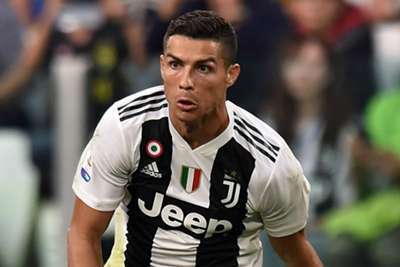 Cristiano Ronaldo will aim to extend his strong record of scoring against former clubs as Juventus take on Manchester United at Old Trafford in the Champions League on matchday three. The Italian champions will hope their Portuguese star shows his old employers that he has not lost his eye for goal, while in-form Manchester City striker Sergio Aguero could have the chance to claim two goal-scoring records should he feature against Shakhtar Donetsk. There is huge pressure on Real Madrid to claim all three points against Viktoria Plzen following another disappointing LaLiga defeat at the weekend, and Julen Lopetegui's position as head coach may depend on it. 43 - Real Madrid have scored in each of their last 43 Champions League home matches, their most recent blank coming in a 2-0 defeat to Barcelona in April 2011. 26 - Los Blancos have an unbeaten home record in Champions League matches that stretches back 26 games to October 2009, when they were beaten 3-2 by AC Milan. 2 - United's task looks all the more difficult when you consider the fact that Juventus have lost just two of their last 23 Champions League group stage games (W14, D7), with those defeats coming against Spanish opposition. 5 - Ronaldo has scored five goals in the six Champions League games he has played against his former clubs, including one in each of his appearances for Real Madrid against United. 50 - Should Aguero feature for Pep Guardiola's side in Donetsk, he will become the first City player to make 50 Champions League appearances for the club. 22 - Aguero's Champions League goal tally for City stands at 22, and if he scores again he will pull level with former Chelsea striker Didier Drogba as the player with the joint-most goals in the competition for an English club. All smiles as we get on our way to Kharkiv! 5 – AEK Athens have lost five of their seven European meetings with German opponents, with the solitary win coming against Bayer Leverkusen in the 2000-01 UEFA Cup. 6 – Bayern Munich have kept a clean sheet in each of their last six matches against Greek opponents, scoring 16 goals in the process. 1 – Valencia have lost just one of their 11 previous meetings with Swiss opposition, though it was their most recent away match against them – Basel in the 2013-14 Europa League. 0 – Young Boys are yet to score in the Champions League this season – they have conceded more goals (6) than they have had shots on target (5). 12 – Ajax's Hakim Ziyech has attempted the joint-most shots in the Champions League this season (12, level with Lionel Messi), however he has failed to find the net. 4 – Benfica won their first ever European meeting with Ajax in 1969, but are winless in their subsequent four against them (D1 L3). 6 - Roma have won all of their last six home games in the Champions League, conceding just two goals in the process. 11 - Edin Dzeko has scored 11 Champions League goals since the start of last season - only Cristiano Ronaldo (15) has netted more in the competition during that time. 75 – Nabil Fekir has been involved in 75 per cent of Lyon's Champions League goals this season (1 goal, 2 assists). 1 – Hoffenheim have won just one of their 10 matches in all European competition (D3 L6). Their solitary success came against Istanbul Basaksehir in last season's Europa League.